County officials won't act on two citizen complaints about a large Confederate flag that flies over Virginia's I-95. Citizens who signed up to speak at the county board meeting Tuesday night were never invited to speak. An attorney for the complainants said there are more options for residents who oppose the flag, including courts and appeals. 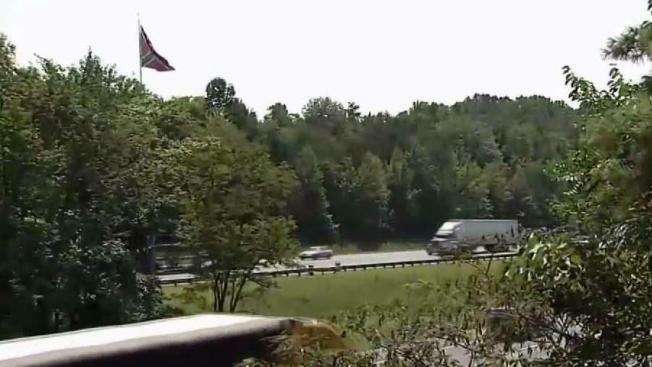 A large Confederate flag in Stafford County will continue to fly over Interstate 95 after county officials declined to take action, despite the requests of angry residents. Dozens of residents attended a hearing Tuesday night, and some had signed up to speak their case about the flag. Many of them carried signs with slogans including "Hate never made any nation great" and "white silence is white consent." Two hours into a public hearing Tuesday evening, the Stafford County Board of Zoning Appeals hadn't called any members of the public to speak. Confederate Flag Along I-95 Draws Protests in Stafford Co.
Then, they voted to dismiss a complaint filed by two members of the public who said the flag violated signage rules. The board members decided the residents didn't have standing to make the complaint. "That's just hatred," Melvin Allen, a member of the Stafford Couny NAACP, said. Several people told News4 they were furious that they didn't get a chance to speak at the hearing. "This is a kangaroo court. They had a public hearing here, then they talked for two hours," county resident Kevin Raymond said. "It's shameful that people can't even speak to an issue like this. We can't have a civil conversation? That is disgraceful," resident Nicholas Iroaka-Ohia told News4. One woman stood to leave the room and yelled, "Let us speak. What are you afraid of?" An attorney for the two residents who filed the complain wants to keep fighting the flag and is weighing options. Residents could appeal to the courts or possibly file a new complaint.